Knight Open Government Survey by National Security Archive Covers 149 Federal Offices, Concludes "File Not Found"
Washington D.C., 12 March 2007 - Ten years after Congress enacted the Electronic Freedom of Information Act Amendments (E-FOIA), only one in five federal agencies actually complies with the law, according to a new survey released today during Sunshine Week by the National Security Archive. Passed in 1996 and effective in 1997, E-FOIA ordered federal agencies to post key records online, provide citizens with detailed guidance on making information requests, and use new information technology to publish information proactively. The act's intent: Expand public access and reduce the burden of FOIA requests. Many agency Web links are missing or just wrong - one FOIA fax number checked in the Knight Survey actually rang in the maternity ward of a military base hospital. "Federal agencies are flunking the online test and keeping us in the dark," said Thomas Blanton, the Archive's director. "Some government sites just link to each other in an endless empty loop." "Public access on the Web to government information is the only long-term solution to the backlogs and delays that undermine the FOIA today," said the Archive's general counsel, Meredith Fuchs. "This audit plus Congressional oversight should provide a wake-up call to the agencies." Fuchs cited the Education Department and NASA as "E-Stars" with excellent FOIA Web sites, and the Air Force, Immigration and Customs Enforcement, and Veterans Affairs as among the dozen "E-Delinquents." Last week, the Archive faxed the top FOIA officer at each of the E-Delinquents with advance notice of the Survey and the critical findings specific to that agency. "It's appropriate that this important news is being released during Sunshine Week, when millions of Americans will be able to see it," said Eric Newton, vice president of the journalism program at the John S. and James L. Knight Foundation. "People need to know when their government is not obeying its own laws." The Emmy- and George Polk Award-winning National Security Archive at the George Washington University has carried out five government-wide audits of FOIA performance over the last five years, prompting multiple Congressional hearings, compelling agencies to clean up their backlogs of oldest requests, and providing evidence for bipartisan reform legislation now pending in the Congress. This Knight Open Government Survey was made possible by generous funding from the John S. and James L. Knight Foundation. This report was written by Kristin Adair, with additional writing by Catherine Nielsen and Meredith Fuchs, and was edited by Meredith Fuchs, Malcolm Byrne and Thomas Blanton. Production of the final report relied on the teamwork of many people. This report could not have been completed without the valuable contributions of the following law clerks: Tracie Robinson and Sarah Schwartz from The George Washington University Law School, Hannah Bergman from American University's Washington College of Law, and Renee Dopplick from Georgetown University Law Center. Our law clerks assisted with legal research, Web site reviews, drafting, editing, and a multitude of other necessary tasks. Thank you to Barbara Elias for an early version of the methodology used in this report. Michael Evans deserves our appreciation for his efforts in making our text and data accessible to the public on our Web site at http://www.nsarchive.org. 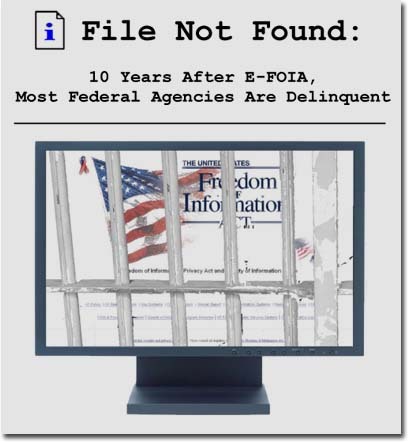 The release of "File Not Found: 10 Years After E-FOIA, Most Federal Agencies Are Delinquent" is part of Sunshine Week, sponsored by the American Society of Newspaper Editors. The Archive also acknowledges the contributions of other colleagues at OpentheGovernment.org, the Coalition of Journalists for Open Government, and the Sunshine in Government Initiative. Support for the Archive's Freedom of Information policy and litigation efforts is also provided by the HKH Foundation, the Deer Creek Foundation, and the Rockefeller Family Fund.